Samurai TO-FU is ready for action! 1:6 scale action figure stands 15-inches tall. Features multiple points of articulation and excellent detail. Includes interchangeable hands, lots of accessories, and his friend Frog! The result of a collaborative effort between Threezero and Devilrobots, this Samurai TO-FU 1:6 Scale Action Figure is ready for action with a plethora of accessories, and he even comes with his friend Frog! Standing roughly 15-inches tall, Samurai TO-FU also features multiple points of articulation and excellent attention to detail. His accessories include a bamboo hat, five interchangeable hands, a scarf, and a kimono, plus his samurai sword, wakizashi, and gun. 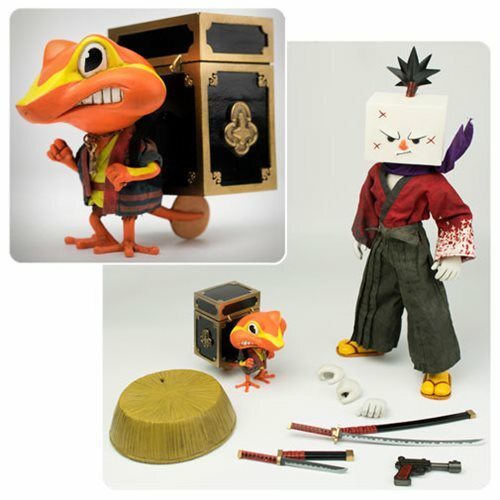 The included Frog figure sports a cloth robe, two pairs of interchangeable hands, a necklace with a key, and a cabinet accessory! Ages 15 and up.